Whenever I mention Luis Rey in the context of being a palaeoartist whose work I'm rather fond of, I am normally met with a wrinkled nose, an arched eyebrow and an exclamation along the lines of 'really!?!'. Certainly Rey has his fair share of detractors, and one of the most common criticisms of his more recent work is that he's taken leave of his senses in Photoshop, cloning dinosaurs here, smearing photomanipulations there, and generally making a bit of a mess. There seems to be a quite widely held opinion that Rey's work is better when he sticks to paint and pencils. 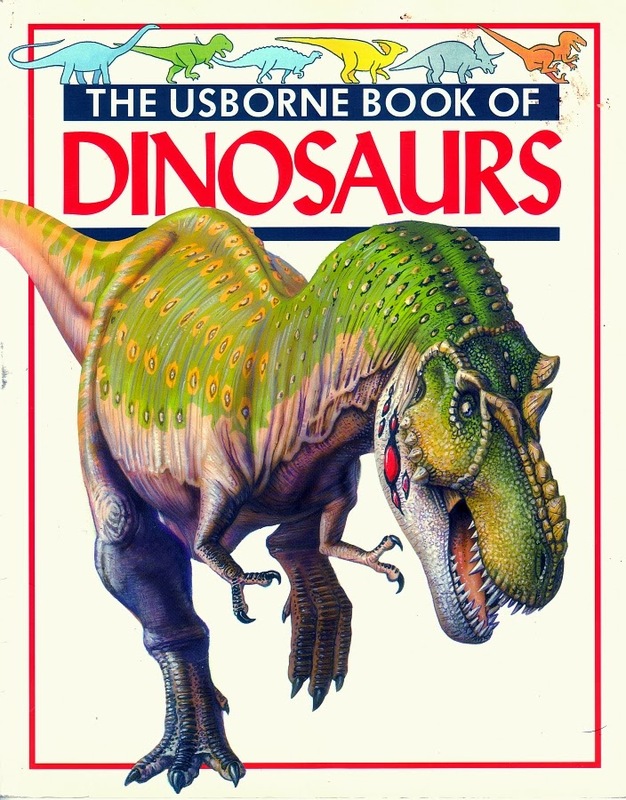 With that in mind, hopefully even the most ardent Rey-o-phobes will be interested in (and maybe even appreciate) seeing some early Rey – from 1993, in fact – in The Usborne Book of Dinosaurs. I have this compulsion that occasionally rises up, demands attention, prompts feverish work, and subsides until it sees fit to return. 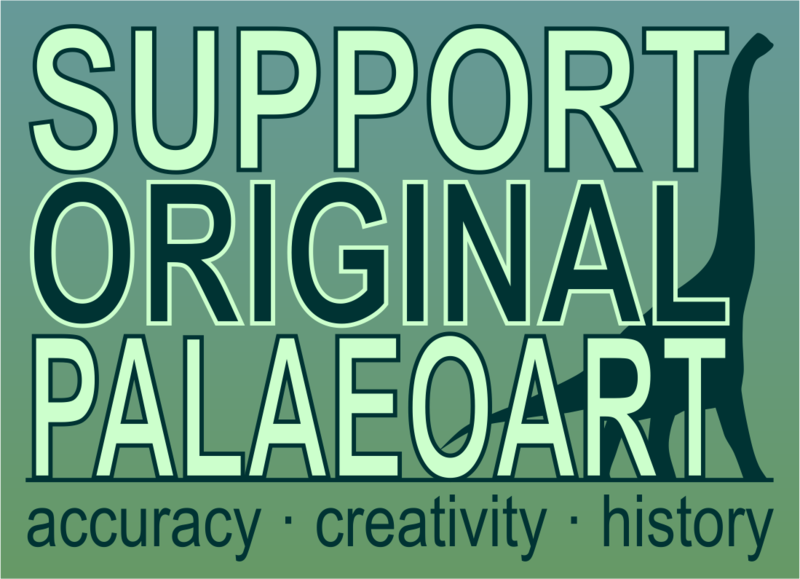 I am compelled to design the kinds of paleontology-inspired apparel, stickers, and whatnot that I'd like to wear. I'm kind of picky when it comes to graphic shirts, you see, and when I visit a big museum I'm always hoping that they'll have designs than hit me in my sweet spot. Let's call it graphic simplicity. If you've been hanging around here, you may remember me sharing such designs here in the past - I Left My Heart in a Prehistoric Age, Dinosaur Hearts, and of course the set of minimalist family crests that I came to call Cladistic Heraldry. If this kind of stuff hits your sweet spot too, well, I've got some damn splendid news. I recently created a set of designs and I think they're pretty nice. I call the set The Society of Palaeontology Fanciers, and like the other projects I mentioned above, it gives to the chance to proclaim your allegiances to extinct taxa to the whole world. These are all seven of the first batch. The impetus for the set came when I was doodling, and started playing with minimalistic renderings of stem-birds. I have to say that as I worked on the design above, of a vaguely deinonychosaurish animal, it was freeing to not to have its damned arms sticking out. When it comes to artistic renderings of animals closely related to modern birds, I find I am less and less satisfied with artists staying close to skeletal contours. In my doodling, I came to challenge myself to find a way to an iconic rendering of just such an animal. I didn't want it to be easily confused with a modern bird; or if it was on first glance, I want it to inspire a double take. Once I felt that I'd achieved it, I was in full-throttle design mode and I played with various non-avian dinosaur forms. Each took on a life of its own. One of the fun challenges of these sets I like to do is to resolve drastically differently scaled animals into a cohesive series. Once my dinosaurs were done, I was compelled to do a trilobite, specifically the Cambrian Oryctocephalus. I'm flattered by the fact that when I do projects like this I get a lot of "do such and such!" or "what about whatchamataxon?" comments. I certainly want to do more. Before I do any more for extinct critters, however, I'm working on a set in hopes of doing a tiny bit to help extant raptors from going extinct. 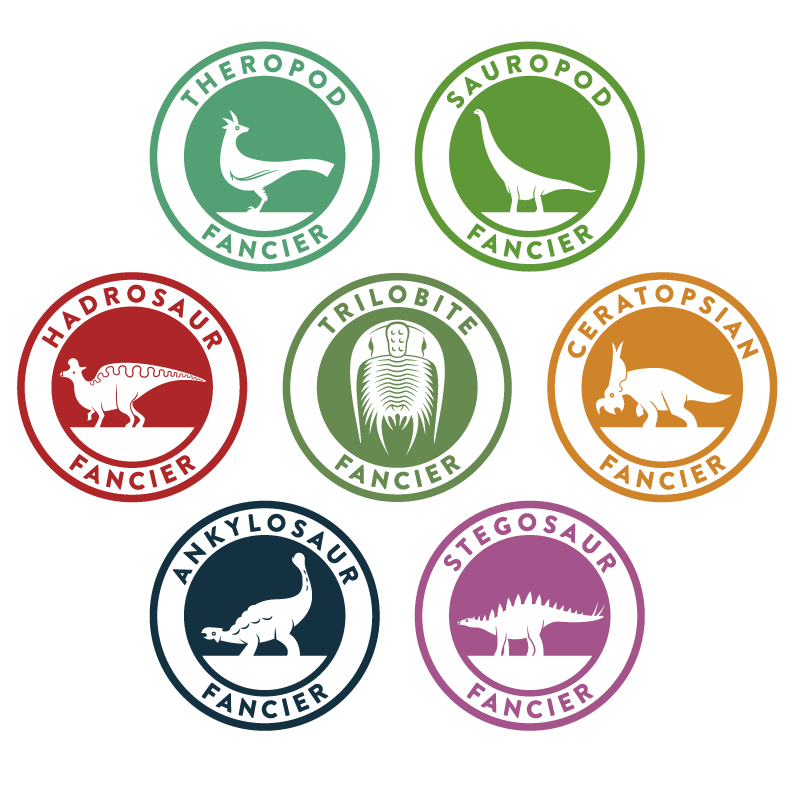 These I hope to realize as genuine embroidered patches which will be sold in the Indiana Raptor Center's new gift shop, and maybe down the line I could even have the capital to make patches of my paleontology designs, as well. Anyhow, if you're moved to pick up a shirt or two, these are available in the base colors above, as white designs on dark colored shirts, or as black designs on light colored shirts, so no matter your preferred style and color, there should be something to your liking. Atopodentatus! Atopodentatus! What in the heck is going on with that crazy mug? Brian Switek and Jaime Headden both sum up this Triassic marine reptile and its bizarre split, needle-toothed maw. Gobivenator isn't as weird as Atopodentatus, but hey. New troodontid from Mongolia. More from Dave Hone, Everything Dinosaur, and Nobu Tamura. So, this silver age comic called The Wanderers once featured a dude morphing into a gloriously ugly Deinonychus. For the sole purpose of getting Biblical with a female Deinonychus. When do we get to the point that Hollywood is desperate enough to make this? Dr. Michael Ryan's Palaeoblog is back! At the Integrative Paleontologists, Sarah Werning drops some learning... about the blossoming world of paleontology podcasts. Please note that we also added a list of these to our sidebar. Also, Andy Farke discusses dinosaurs and chocolate. The CBS Sherlock Holmes adaptation Elementary recently featured some consarned black market fossil rustlers. Switek's got it covered. Dr. Bakker answers a burnin' question about the feet of Dipsy the Diplodocus at the Beyond Bones blog. Luis Rey's artwork was featured in the closing credits of Walking With Dinosaurs 3D, which is great for Luis... only they didn't like, credit him. At his blog, Rey lays out all of the work that was featured. Also, in case you haven't heard, there is going to be a Cretaceous Cut of WWD3D on its Deluxe Edition 3D Blu-ray, so you may now applaud, hoot, holler, fist-pump, or stoically nod in approval. Whatever it is you do. Mark Witton wants to write about the crocodyliformes of the Wealden Supergroup, so he's going to do it, dammit. Whether you like it or not! Matt Martyniuk wants to write about the recently proposed Bohaiornithid clade of enantornithes, so he's going to do it, dammit. Whether you like it or not! At Paleoillustrata, Stu Pond wrote about the beginning of his life as a PhD student, including much reviewing of literature for his research into Polacanthus foxii. Good luck, Stu! Trish Arnold is awesome, so she created dinosaur versions of the popular Wuzzles™ characters. If you're not on Twitter, she's reason enough to join. Paleoart Pick In honor of Stu Pond and his studies, let's go with Polacanthus, shall we? Here's the most accurate one I've been able to find in an exhausting, eye-bleeding twelve hours of intense internetting. It's the work of Bill Swets, a retired fireman in Fort Collins, Colorado, who used to operate the Swetsville Zoo, populated by his own metal animal sculptures. Here's Polly Polacanthus. Photo © Paul Turner, via Flickr. Back when I were a wee lad, I were an avid collector of the various prehistory-themed picture cards that were given away with PG Tips teabags, Jacobs' dinosaur-shaped biscuits and the like. It's a practice that seems to have gone the way of PG Tips' ill-advised chimp-fronted advertising campaigns, but one with a long and noble prior history (with the caveat that the idea stems from the inclusion of picture cards in fag* packets, of course). Teabag peddlers Brooke Bond, who themselves owned PG Tips before being swallowed by sinister corporate behemoth Omnicor...uh...Unilever, produced a number of picture card series back in the day. 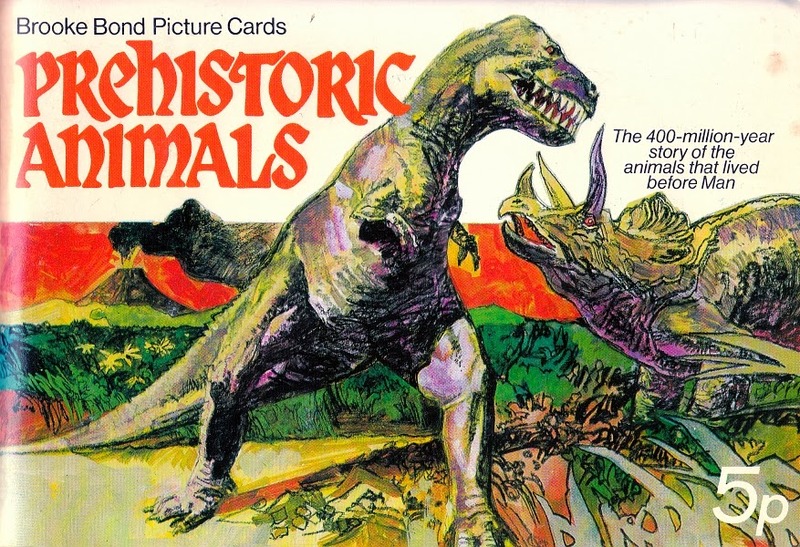 Prehistoric Animals dates from 1972 (according to my dodgy internet-based research - the album itself isn't dated), and just how well some of the illustrations have aged may well surprise you.